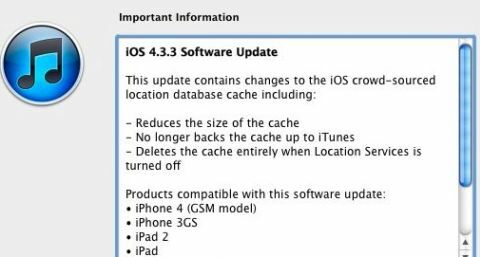 Apple has finally responded to the privacy issue which involves continuous tracking of user’s location with the release of iOS 4.3.3 software update for iPad, iPad 2, iPhone 3GS, iPhone 4 (GSM), third-generation iPod touch and 4th-gen iPod touch. As promised, the update is designed to fix the location-tracking bug which stores the location history for long period of time by removing the unwelcome “iSpy” capability that able to track location even while the GPS is turned off. The latest version of iOS firmware – iOS 4.3.3, is now available as a free download via Apple iTunes to directly update your iDevice. Alternately, you can directly update your iOS devices to iOS 4.3.3 from the below direct download links!